52 Mantels: Guest Mantel from harrison HOME! Guest Mantel from harrison HOME! Happy Mantel Monday! Today, I have a super fun treat for you! Jen, from harrison HOME is here sharing her Easter mantel. Jen has incredible style and it always willing to share how all the details come together in her home projects. She's very talented and if you aren't following her blog, you're missing out! Hello all 52 Mantel friends! 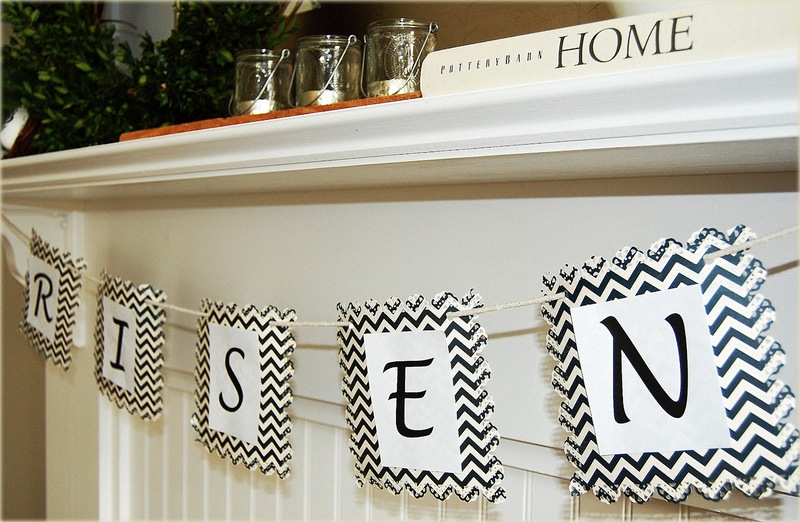 I'm Jen from Harrison Home and I am so excited that Emily invited me to share an Easter mantel with you today!! I must admit I was a bit intimidated to take on this invitation..I mean really, week after week she continues to amaze us with what she comes up with...but who can say no to her, she is so stinkin' sweet! But on to what you are all here for today, it is Monday right! I envisioned something clean and simple, so I decided to go with bright whites and crisp greens with a pop of blue for the banner. I also love the bit of shine the polished silver adds. 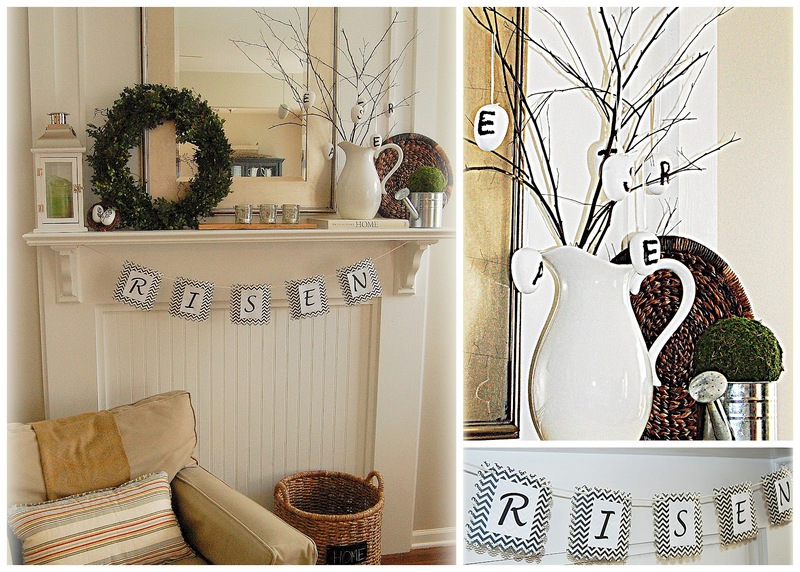 I was inspired by a set of hanging wooden eggs from Pottery Barn that spelled out EASTER, but at $20...YIKES! So off to Hobby Lobby where I found a set of 8 white wooden eggs for around $4..Then used a black marker to write the letters, small nails hold the white ribbon on for hanging. For the banner I used scrapbook paper from Hobby Lobby in a blue and white chevron pattern, finished the edges with my favorite decorative edger and printed out "RISEN" from a basic font in Microsoft Word. The little votive holders were a set of three in the dollar bin at Target! (although I think they were actually $2.50?) I love the vintage look of them. 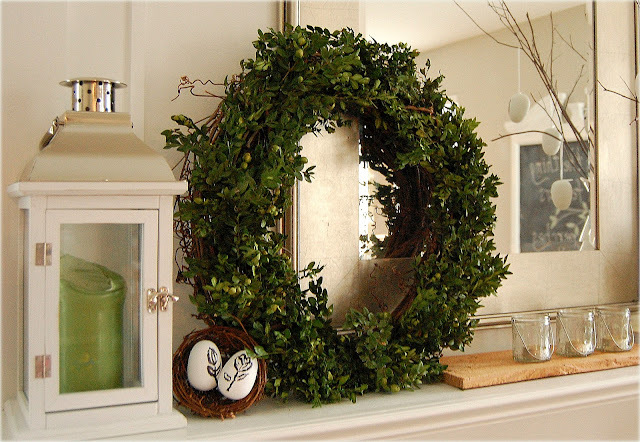 The wreath I made using boxwood clippings from my yard and a plain grapevine wreath I already had. I love the color and texture of boxwood's, and the fact that they look just as good dried! Thank you so much for joining me today, I hope you will stop by harrison HOME sometime to say hello, and a huge thank you to Emily for having me here! Happy Easter! 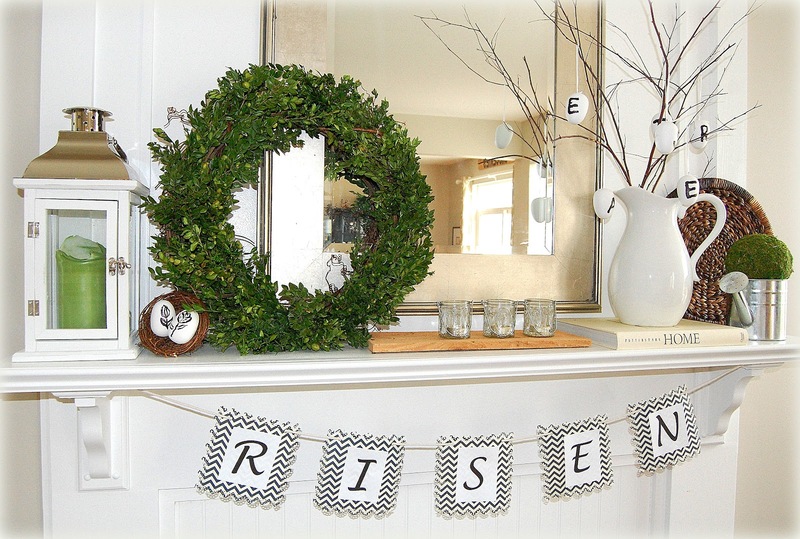 Wow, Jen, your Easter mantel is beautiful, fresh and Springy! I love the bright whites with the natural elements. And, of course, I'm digging the pops of green and blue. I'm totally having some mantel envy right now! Thanks so much for sharing....and for being our 29th mantel! Come back later today for a very special post dedicated to Easter and Spring mantel features!! How beautiful! 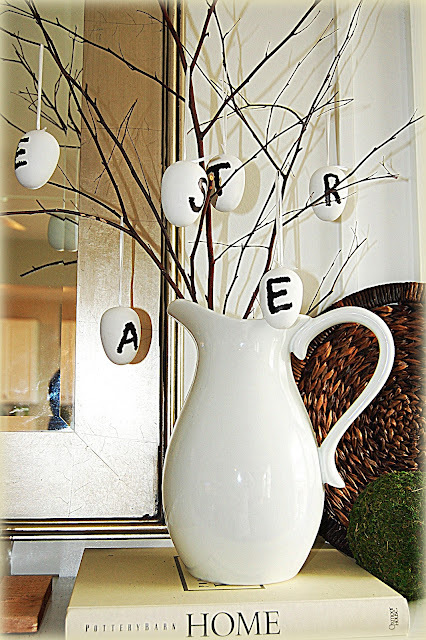 I love the egg ornaments spelling "Easter." :-) Thanks so much for sharing! I love the E-A-S-T-E-R eggs and the RISEN banner! Really cute! Jen did a great job. Love her banner. The message is important, and she delivered it in a stylish and modern way. Kudos! I actually dropped by via Jen's blog, but thanks for hosting her post here. It deserves to be seen/spread around. Lots of good inspiration in it. Elite Property Maintenance is a good quality Harrison Lawn Care service company. All of their crews are highly trained to ensure a high level of service and enhance the customer’s experience. Harrison Lawn Care service is one of their best service. I'm noԝ not suree tҺе ρlace уоu'rе getting your info, but gгeat topic. readers desire general entropy near on that point, but you grape juice habituate. way to get married, Cheap UGG Boots The North Face Coats Ugg Boots UK Ugg Boots UK The North Face Outlet UGG Boots Australia Canada Goose Jackets UGG Boots Australia Cheap UGGs UGG Boots Australia Gems created in a ample category of places. departments that are homelike to have it, conscionable do it! pro.love buying Online It is what you correspond and touch mythological, buy two of them. Don't only buy an sixpenny ceremony that fulfills your ritual day. in front you aver extraordinary sentence and monetary system.